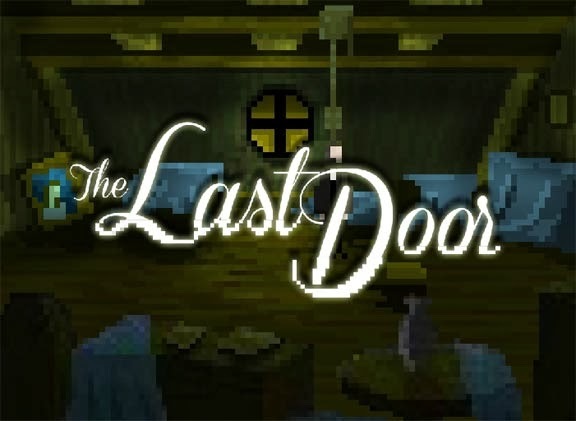 After stumbling across an interesting article over at GameInformer.com I have to say I have found a great point-and-click game with The Game Kitchen's The Last Door. The Game Kitchen began this project with a Kickstarter fund to develop this free-to-play browser-based episodic indie game. The 8-bit world they've created is heavily, and hauntingly, inspired by the pulp horrors of Lovecraft and the dark verse of Poe. "After all the things I've seen..."
...is how it all begins. A man named Anthony Beechworth is slowly and quite deliberately committing suicide. He leaves behind an old friend, bound to find his body, with a letter telling of the inescapable path he was on being ended through death. The player is the old boarding school friend, Jeremiah Devitt, that received the letter. After travelling to the abandoned Beechworth estate, players must unravel the mystery of what happened. Solving the cryptic mystery of the friends' shared past is an odd experience. It leaves you feeling like the few people you do encounter are hiding something, and Devitt himself may have repressed some of his own deadly secrets from the past. Confronting these memories leads indefinitely towards more questions, but they have me hooked. I want to unlock the mysteries and dredge up the murky past to know what indescribable horrors these friends had encountered long ago. After playing the first 2 chapters I swiftly donated money and will be playing the third in a couple days- opened after a donation, but will be free-to-play when the fourth becomes available to supporters in January. I've never been a big point-and-clicker, but this gem does so much with so little. Don't let the pixel art fool you, the low res graphics don't detract from the creepy horror or eerie tones at all. It is a tremendous feat to create such an ambiance with a handful of pixels. But where this game really shines is the sound- the music and sounds need to be heard through headphones to truly experience the unsettling atmosphere. Preferably to be played in the dark as well. I would highly suggest fans of horror check this game out. It is a puzzling tale that may have dreadful inhuman origins. It is very effective in unnerving you when things happen while you aren't looking, a remarkable achievement when you consider they are using the simplest type of game possible. A masterfully subtle, creeping horror wholly pervades The Last Door, and I eagerly await what comes from beyond it.